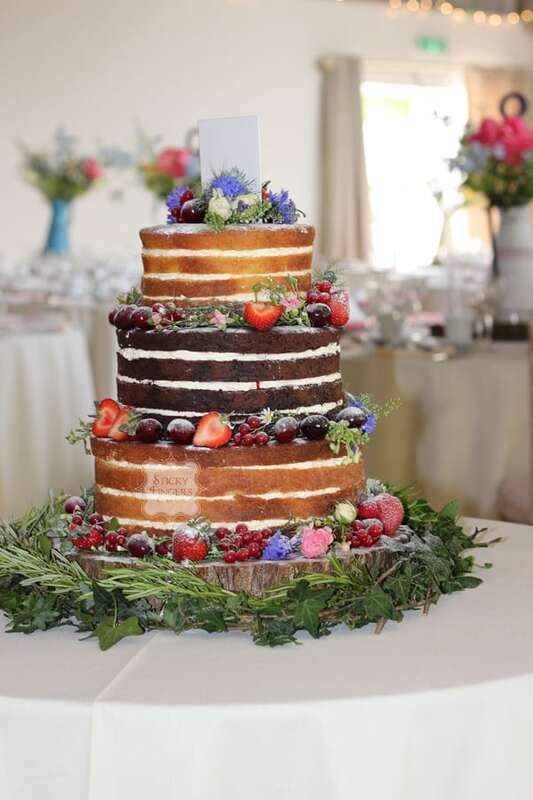 We were really excited to deliver Sarah and Paul’s naked wedding cake to Houchins Farm, Coggeshall, Essex – the first time we’d delivered there. Houchins Farm is a relatively new venue but the buzz about it in and around the Essex wedding industry is huge, hence our excitement! Sarah was keen on having fresh flowers as well as fruit on their cake, so we met up with Anna (Houchins in-house florist – who was lovely by the way!) and she supplied us with an array of gorgeous wild flowers to dress the cake with. Once finished, the cake looked amazing and in keeping with the whole feel of the day. Sarah and Paul decided on having Lovely Lemony Lemon cake, Black Forest cake and Zesty Orange cake as their flavours and were serving it as dessert. I also made some dairy, egg and nut-free Brownies for the children too.